Since you made it to this chapter the idea of a franchise is intriguing enough that you decided to read on. Now we want to help find you the franchise that is right for you. Unfortunately, this is no easy task. I mean, Entrepreneur keeps a list of the Top 500 franchises and the Small Business Administration currently has directory of over 2,000 approved franchises, so there are plenty of franchise models to wade through. We will walk you through myths, tips and resources to help you find the perfect franchise for you. The first step in choosing the best franchise for you is determining if any franchise is best for you. (Shocking, we know.) To tackle this, let’s start with a common misconception about franchise ownership: the requirement of prior experience. I have good news and bad news for this one. Bad news first: some franchises will require that you have X amount of years working in their industry, to ensure you have the experience required to successfully operate a location. Good news: some of them don’t! You do not need to have prior experience in a given field in order to be a successful franchisee. For example, a Jiffy Lube does require workers who have experience and skill with cars. But that doesn’t necessarily have to be you. As the owner, your job can be to manage the office and your employees. And it can be your employees’ jobs to care for your customers’ vehicles. So, the experience you need to run a Jiffy Lube is more on the office management side, and less on the car side, even though Jiffy Lubes exist in the automobile industry. Now we know that you can be a franchisee if you want to be. So how do you know if you do, in fact, want to be? This answer will likely differ for each of you, but we think a good place to start is some serious introspection. Think about yourself, your traits, your goals, your strengths and weaknesses. Do you embody some or all of the traits that make a successful franchisee? How do you even know what those traits are? The world wide web is full of tests and quizzes that can help you narrow down your decision of whether franchising is the right choice for you. Let’s be frank: these are not vetted, scientifically sound tests. There is no guarantee that you will make a great franchisee if one of these tests says that you will. What these tests do have going for them is the questions they ask, which will hopefully help direct that self-reflection we talked about. They may also bring to light aspects of franchising you haven’t thought about. These are examples of free, easily-accessible online quizzes: this one from Franchise Help, and this from Franchise Opportunities. There are personality and aptitude tests professionally developed by companies who specialize in this arena. These tend to be much more in-depth, and aim to indicate which type or category of franchise would be a good fit for you. Results might show that you, who exhibits the traits of a social butterfly, should look for franchises that include a high-level of customer interaction. Or that you, the non-conformer, should seek out a young franchise that offers more flexibility – not one already entrenched in its methods. Tests like this also tend to come with a price tag. Yet other types of tests focus more on identifying what your goals are for the franchise process, so that you can narrow down franchise brands that way. This is the type of test, and the categorical version above, that is most commonly utilized by franchise consultants. Which brings us to another resource at hand, the franchise consultant. A consultant can be very useful, both in helping you decide if franchising is right for you, and then helping narrow down the giant world of franchises into something more manageable. A franchise consultant is a professional who specializes in helping you find the right franchise fit. He or she will help you identify your goals – what do you really want to achieve through business ownership? – and narrow down the list of businesses that fit those goals. They know the questions to ask, how to help you find financing, the information you’ll need to collect and many other nuances in the complex world of entrepreneurship. 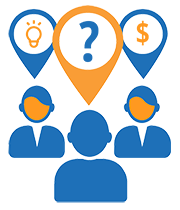 Location – it’s definitely preferable to select a coach who is geographically close to you, to make face-to-face meetings much easier. Full-time status – generally speaking, a coach or consultant who works full-time as a coach or consultant will be able to give you more time and attention than an individual who is only a coach on the side. That said, it doesn’t have to be a deal breaker if you find somebody you feel good working with. Just make sure to have the time commitment conversation up front, so you know what to expect. Consulting experience – this one is a bit of a no-brainer, but we’ll mention it anyways: select a consultant who has successfully coached entrepreneurs before. Shoot for someone who has some experience in the field and has already learned from past mistakes. Franchise ownership experience – This one is less of an obvious option. Having a coach who has actually gone through the process you’re going through now can be a huge win. Even better, a consultant who has owned and operated a business will bring invaluable experience to the table. A variety of franchise options – a dirty little secret of franchise consulting is that some consultants only work with a handful of franchise brands. This means that you may be encouraged toward a brand that isn’t necessarily the best fit for you. Does that mean it’s a bad fit? No, definitely not. But do keep an eye out for coaches who aren’t able or willing to show you a broad range of brands. If you’d like to go the independent research route, there are a multitude of websites that list out franchises for sale. Often these sites will allow you to filter results by location, industry and investment amount. They also typically have searchable categories like low-cost, top-rated and new franchises. These sections make it easier to find a franchise that fits your specific requirements. Okay. So, you’ve worked with a franchise consultant or have done your research independently and are narrowing down your favorites. You’ve expressed interest to the franchise corporate team, spoken with them on the phone and traded relevant information as you each work to determine if the other is a good fit. So far, things are going well for both sides. At this point, you may be invited by the corporate team to a Discovery Day. Which is what, exactly? Excellent question! Discovery Day is the opportunity for you to ask questions, see how the business is run and experience it all first-hand. You’ll speak with the people who actually manage and run the franchise, see the office space and tour any warehouses or production sites your brand may operate. This is your opportunity to get any lingering questions answered and decide once and for all if this brand is the right fit for you. Travel and lodging expenses are out of your pocket. The franchise may offer to foot part of the bill, but most of it will be on you. This is one of the main reasons that attending Discovery Day is meant for someone who is pretty serious about the brand. Prepare for your visit. Have a list of questions or details you want to learn about. A good way to formulate this list is to speak with current franchisees of the brand. Learn from their experiences, both from Discovery Day and working as a franchisee. Dress for success! This is a two-way job interview, so make a good first impression with professional attire the same way you would with a traditional, corporate job interview. If your spouse isn’t going to be a business partner, they’re still highly encouraged to join you at Discovery Day. This is to ensure that your #1 supporter is 100% on board with your brand choice. The franchise team will also be looking to make sure the two of you are on the same page. It’s common for the franchise team to take you and your spouse to lunch, dinner or both. Have fun and enjoy yourselves, and just keep in mind that you’re still in a two-way interview. At the end of the proverbial day, Discovery Day is a great opportunity for you to shore up your knowledge about the franchise you might invest in, and vice versa. Enjoy this part of the journey! Throughout this chapter, we’ve covered resources to help you decide if you want to be a franchisee, resources to help you narrow down your list of potential brands and what to expect from Discovery Day when you’re close to picking a franchise. Next chapter we’ll take a quick look at actual franchise brands in useful categories, like top low-cost franchises and popular franchise industries. Get excited! The Best Franchise Brands For….